Bought your first bag of grass seed yet? Thinking about a new hose? Scrolling through Angie’s List for a good lawn service? Uh-huh. Well think about where your lawn maintenance money is going, because these are $24 Billion questions. As Wilson Pickett sings “Don’t Let the Green Grass Fool You.” What I’ve found is that we seem to place such a high value on the perfect lawn but yet, don’t place much value on those who care for them. We can be fools about our lawns. Obsessive would be an understatement for some. Be it Beverly Hills or any patch of green in Piscataway or Akron I suspect. We like to look at them, sprawl on them, breathe nostrils-deep and admire them. It says something. There was a man near my childhood home in North Carolina named “S.L.” – that’s what everybody called him – and every afternoon after finishing a hard day’s work as a house painter, he would stand out on his finely cut lawn, smoke a cigarette or two and just gaze out far beyond the horizon. He was in his domain. He was proud. He was figuring out a lot of things about the world on his lawn and you knew it. Now that I can respect but its the folks that go over the top with their odd fascination with their lawns and the people who do the hard work to make them look good that concern me. 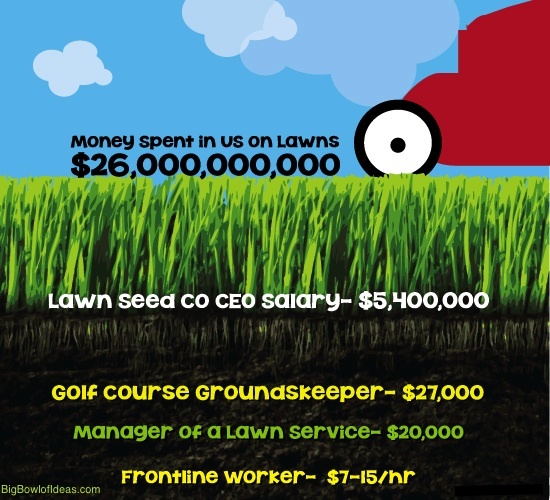 For the frontline workers, the grass is definitely not greener. We spend a pile of dough on this obsession. An industry report from HighBeam Business says that “according to Dun and Bradstreet in 2010, 92,325 establishments in the lawn and garden services industry brought in revenues of $23.98 billion. Companies with fewer than 100 employees accounted for 99 percent of employees and 80 percent of revenues.” The lawn services game is hella packed with thousands of small businesses. Most firms (80 percent) have four or fewer employees. No surprise there. But this translates into grounds maintenance workers holding about 1.2 million jobs in the 2009, according to the U.S. Bureau of Labor Statistics. Roughly 36 percent of workers were employed by companies providing landscaping services to residential and commercial customers. And then there’s the unaccounted like your kids or the day laborers that some(ok, most) people paid in cash as this Fox News article about a proposed Georgia law affirms. But who is really getting paid? Well, stakeholders in the ‘let’s keep up a façade in a bad economy’ game are one set. You see, even in empty homes – say those vacant due to foreclosure, there’s money to be spent on grass. Last year, ABC reports, American taxpayers will spend more than $40 million just to keep the lawns mowed at these addresses. There are many other winners and losers in this gigantic grass economy. Like, the owner of Scotts Miracle Gro, James Hagedorn whose compensation was $5.4 Million in 2012. Yet, out of 204 jobs recently listed for Scotts on the job search website Indeed, 134 of them were pegged at being likely under $30,000. And that’s not counting the person just cutting the grass for one of Scott’s Lawn Care franchises that are popping up like weeds. The market on wages can seriously vary. On discussion boards on Yahoo! and elsewhere, folks are saying no more than $10 an hour. Others proposed pay based on square footage, a little extra for trimming perhaps, different if done by a team. Its all over the place. But no matter how you slice it, its unlikely that those in frontline lawn service will have a lawn or home like Mr. Hagedorn. Let alone healthcare, health and safery protections or other benefits. Think about that at Augusta National this year in addition to their normal, um, “diversity challenges.” “Beautiful place, bad work environment”, a former Groundskeeper wrote online. In addition, there’s serious environmental impact with all of this perfectly manicured lawn mania, as noted by Duke’s School of the Environment Dean Bill Chameides. Which all brings into question the very notion of what having a home is supposed to mean in the first place. Keeping up with the Joneses is turning more into keeping up with the Rockefellers, and in lawn care, we’re led to think we can and should manage that competition. And with the inequities found in the care of lawns empires big and small have and will continue to rest on them.